3. Continue to utilize the buddy system and know you’ll have someone with you to help if you fall through the ice. 5.Pay attention to the weather. If it hasn’t been consistently cold or if there has been a lot of wind you can’t guarantee there will be solid ice to head out on. For more information on ice fishing, check out our Ice Fishing – The Coolest Sport Around article. While the northern sections of the state are digging out from the snow storm, the Lower Peninsula is dealing with high water levels in rivers and streams. Water conditions were not only muddy but also had floating debris making its way downstream. River fishing will depend on rain later this week and run-off from snow melt as temperatures push into the 50’s. Lake Erie: Boats launching from Bolles Harbor are fishing the “Hot Hole” off Plum Creek. Shore anglers are targeting bluegill and perch at the Metro Park. Huron River: Is producing walleye and pike. Try Hot-n-Tots, jig and minnow or a worm under a bobber. Detroit River: A couple walleye were caught up near the Edison Plant. Shore anglers are still catching the occasional perch in the canals around Gibraltar. Lake St. Clair: A few boats were launching at the ramps but no word on catch rates. Clinton River: Has shore fishing along the river and on the Spillway however catch rates were unpredictable. Harbor Beach: Ice in the harbors is either unsafe or just plain gone. Brown trout were caught in the Edison discharge channel when the plant is running however nothing was caught when it was off. Saginaw Bay: Has open water fishing. The Pine River mouth is open with high water levels and muddy water. Fishing was slow at Palmer Road due to muddy water. There was no ice from Pinconning south. Those wading in the Hot Ponds caught a few pike but catch rates were slow. On the east side of the bay, fishing is limited to marina basins, and those connected to rivers are very muddy. Rivers and creeks at Sebewaing, Caseville and Port Austin were high, muddy, and full of debris. Saginaw River: Had high water levels. Those out fishing were not able to control their drift because of the strong currents. Conditions might improve toward the end of this week if the area does not get heavy rain. Best bet for the weekend boat anglers would be to head out into the bay and look for clean water. Tittabawassee River: Has high water levels so the current is fast. Anglers need to watch for floating debris. The boat ramps were partially flooded. Flint River: Walleye were starting to move in. Anglers had limited success at M-15, Atwood Stadium and the Holloway Reservoir Dam. With the projected warm weather this week the walleye should be moving in prior to the closure on March 15. Quanicassee River: Boat anglers took a few small perch. Dowagiac River: Is producing steelhead. Water levels were fine. St. Joseph River: Steelhead fishing at the Berrien Springs Dam was good. A few walleye were also caught. Paw Paw River: Is producing steelhead and walleye. Kalamazoo River: Steelhead are running even though water levels were a bit high. Walleye anglers are doing well. Try rapalas or bucktail jigs. Grand River at Grand Rapids: Water levels are up with flood advisories in some areas. Steelhead are there however catch rates may slow due to muddy water. Grand River at Lansing: A couple steelhead were caught at or near the Moore’s Park Dam. A few limit catches were taken in Sycamore Creek. Maple River: Has higher water levels. Muskegon River: Is producing steelhead and walleye downstream from Croton Dam. Some were perch fishing upstream of Hardy Pond but the ice was not safe. Inland lakes should still have ice however deep snow and slush will not only make travel difficult, but will also cover areas that may be dangerous. Fishing continues to be fair at best, with a few perch, walleye, pike and trout caught. With the heavy snow and warm weather, anglers might want to consider removing their ice shanties prior to the March 15 deadline. Alpena: Strong winds should blow the ice out of Thunder Bay by the weekend. Thunder Bay River: The City of Alpena has removed all the snow piled up at the access site so the ramp should be open now. The river is ice-free and there are some steelhead and a few brown trout for those open water fishing. Hubbard Lake: Had fair to good perch fishing. Au Sable River: Had very good steelhead fishing. The access sites and ramps are now open. Higgins Lake: Has foot travel only because of the deep snow and slush. Those taking machines out were getting stuck. Anglers are basically heading out for smelt and perch only. For smelt, try off the west launch in 20 to 30 feet of water. For perch and smelt, try near the Birch Lodge. Smelt were caught during the day however the better catches came at night. Houghton Lake: Travel on the ice is difficult due to deep snow and slush. Some have already pulled their shanties off the ice. Few anglers have been out. Tawas Bay: Ice conditions will deteriorate quickly this week so anglers will need to use extreme caution. Off Jerry’s Marina, a few walleye were caught and a couple pike were speared. Au Gres River: Steelhead are running in Whitney Drain which is on the East Branch of the river. Most of the fish are upstream of the Singing Bridge, where good numbers were caught when drifting spawn. Fish were also caught at the Singing Bridge access site and in the surf when the ice packs move out of the way. Rain and subsequent high muddy water may affect the bite by the end of the week. Deep snow and slush in this region will make travel on ice more difficult. 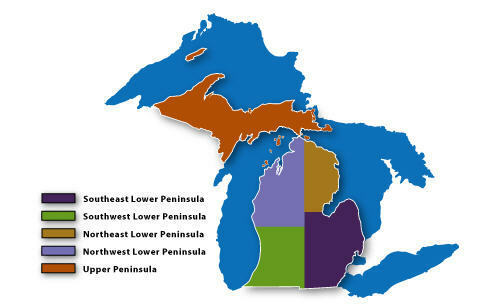 Traverse City: Both the East Bay and the West Bay have open water. Green Lake: Was producing some smelt. Fife Lake: Had ice. Perch and pike anglers will want to head straight out and east of the launch site. Betsie River: Is producing steelhead. Lake Cadillac: Still had plenty of ice but travel through the deep snow and slush was difficult. Lake Mitchell: Fish are there for the taking if you can navigate the deep snow. Lake Missaukee: Still had ice with fair to good pike action. Portage Lake: Was producing the occasional walleye or pike. Manistee River: Should still have some steelhead for those looking for fly fishing opportunities. Warm temperatures and rain this week should bring in some fresh fish. Pere Marquette River: Continues to produce steelhead and catch rates will only improve as the temperatures rise. Keweenaw Bay: A couple coho were caught off Sand Point. A stretch of ice flowing past Sand Point towards the head of the Bay made it impossible to fish this popular site. Rainbow and brown trout were caught near the mouth of the Falls River. Little Bay De Noc: Heavy snowfall limited angler access to most of the Bay. Poor ice conditions along the shore access areas and pressure cracks are creating some problems so those heading out need to use extreme caution at all times. Many have pulled their shanties or moved them to shore. Walleye were caught between Gladstone and the Escanaba River when jigging rapalas in 25 to 33 feet of water or along the Center Reef when jigging or using tip-ups in 18 to 30 feet of water. Perch fishing remained about the same although few anglers were out. Most were jigging wigglers or minnows in five to 23 feet of water near Kipling. Much warmer temperatures could present more problems with the ice so those that still have ice shanties out should take notice and be ready to move them if necessary. Munising: Heavy snowfall and the resulting slush have made travel on the ice difficult. Anglers need to use caution as some of the holes are now snow covered and extremely hard to see. The eastern shoreline between the pier and the hospital seems to be where anglers are heading. The ice at Sand Point has moved in and out a couple times so be sure to use caution. Catch rates for whitefish and splake were poor and most of the fish were very small. Those lucky enough to catch something big enough to keep were using Swedish Pimples, soft-body baits or tip-ups with minnows. Few coho were reported but those jigging for them did catch a couple herring. No smelt to report. Munuscong: Anglers were not having any luck with perch or walleye. Many have removed their ice shanties since the 18 inches of snow fell. Cedarville and Hessel: Musky Bay and Hessel Bay have a lot of nice perch to offer. It takes time and a lot of moving around. Try 10 to 14 feet of water with wigglers or wax worms. This area has approximately 14 inches of snow. Slush and deteriorating ice conditions will be a concern with the warmer temperatures. Just a reminder, you can purchase hunting and fishing licenses online 24-hours a day or make a campground reservation at Michigan's 99 state park and recreation areas at www.michigan.gov/campgroundreservations.